A few caveats, the list below excludes secondary offerings – so there may be some companies that each of you track that are missing. Also, since I used lists provided by the sites, it’s possible I am missing a few IPOs or have companies that may not technically be biotechs but were included on the lists I imported. All that being said, I think the list below is a pretty good proxy. The overall portfolio is basically flat at a -0.5% return – since we all invest for long-term results, most of these return are too early to assess. However, I would say its a positive sign that the entire portfolio is flat. 38 (61%) companies are below their initial public offering price – 7 companies have a current price more than 50% less than their initial offering price. Since biotech stocks are risky by nature, this wide deviation is not unexpected. 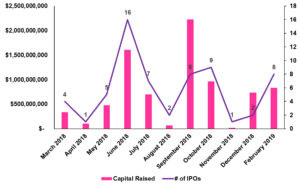 The chart below shows the trend of capital raised and IPO events over the past 12 months. June 2018 was a popular month with 16 IPOs while Q4 2018 saw a slow down with only 3 combined in November and December. February 2019 was a bounce-back month with 8. It will be interesting to see IPO flow in Q2 & Q3 of 2019 – hard to effectively assess as many companies confidentially file. Pretty impressive group of companies to say the least. 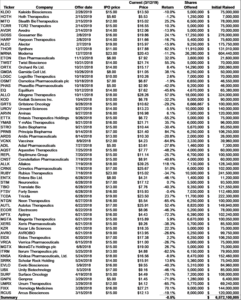 I decided to add a little perspective by adding up the sales values of the 2018 M&A unicorns to the total capital raised from our 62 company list above. Amazing that eight 2018 M&A exits generated $27B more cash than our 62 IPOs while three exits (Juno, Avexis & Impact Biomedicines) each generated a higher return on their own. I get asked often if I think the money flowing to biotech will slow down (this is clearly on the mind of most CRO CEOs as a slowdown would reduce the amount of overall R&D). Below is a chart created by Ernst and Young that I found in a great Forbes.com article written by Healthcare contributor, Bruce Booth. 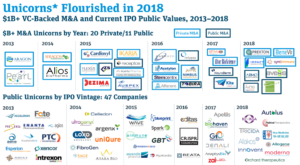 The blue line represents the number of public biotechs and the grey line the number of total public companies. 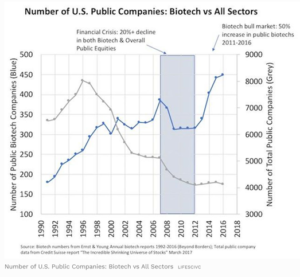 From 1990 to 2007, the number of public biotechs more than doubled while total public companies declined by roughly 38%. I am assuming this trend includes the rise and fall of the dot.coms. From 2007 to 2012, biotech IPOs declined roughly 13% (over industry funding was down as well). Makes perfect sense as this timeline coincides with the financial meltdown period. Total public companies continued to decline as well. From 2012 until present, we’ve seen dramatic growth public biotechs – appears to be close to 40%. Interestingly enough, we haven’t seen any growth in total publicly traded companies. Why the spike in biotech IPOs? Mr. Booth provides the answer: “The lack of late stage capital at this scale, willing to support another chapter as a highly valued private company, helps crystalize the IPO benefits to a biotech: it’s really the only way to access significant amounts of growth stage capital in the sector.” Biotech companies seen to have made the decision that the access to capital outweighs the extra scrutiny and governance required when going public. The rapid advancements in science can be overwhelming, but fortunately, the potential is also breathtaking. I received a lot of great feedback from the last book I posted (“Irresistible: The Rise of Addictive Technology & The Business of Keeping Us Hooked”), I thought I’d share another one. “The Breakthrough: Immunotherapy and the Race to Cure Cancer” by Charles Graeber is a fantastic read for anyone interested in learning more about immunotherapy. Mr. Graeber does a great job of providing the history around immunotherapy, recent developments, and some uplifting and heartbreaking stories along the way. Mr. Graeber’s writing style makes it easy for the reader to understand a complex topic. I highly recommend this book – it’s a great read.